Bra shopping is a necessary evil. You absolutely need them – at least at this age – and they don’t magically appear in your drawer. Anybody who has watched Oprah – and I’m not saying I did – knows that the right way to buy a bra is to go to the underwear (excuse me, I mean lingerie) section of the store and have some stranger measure under, over, and around your breasts. How much fun is that? The same stranger starts handing you undergarments, popping her head in the dressing room to see if you’ve wrangled yourself into one yet (after all the touching, her mere presence seems much less intrusive than that same behavior would have seemed the day before) and pulls, snaps and adjusts to ensure that you have a productive bra-fitting session. The price tag is very discreet – they don’t want you to focus on the fact that your selection will pay the day’s wages for your personal expert. The wrong way to buy a bra is to go to a store and buy the same style and size you’ve worn for the last two decades. Never mind that the hoist factor doesn’t seem to be what it was – it’s the size you’ve always worn. Can it get ‘wronger?’ Yes – buying from a catalog without even knowing what the crisp factor is on the cups. While catalogs have been a blessing in my life, this is not the best method for bra shopping. So I finally ventured into a store to do it right. I was in my forties. My level of modesty is such that if my best friend and I change in the same room we turn our backs to each other. And one reason I know I will never get divorced is because there is no way I’m starting all over again with the angst of someone seeing me naked for the first time. So the experience for me was one step up from having a pap smear. But I persevered. And that is how I ended up with my first underwire bras. I invested in four. Two of the upper end (“this is what Oprah wears!”) option and two cheaper (but not cheap) models that could serve in a pinch if I had to go a couple of days without doing wash. 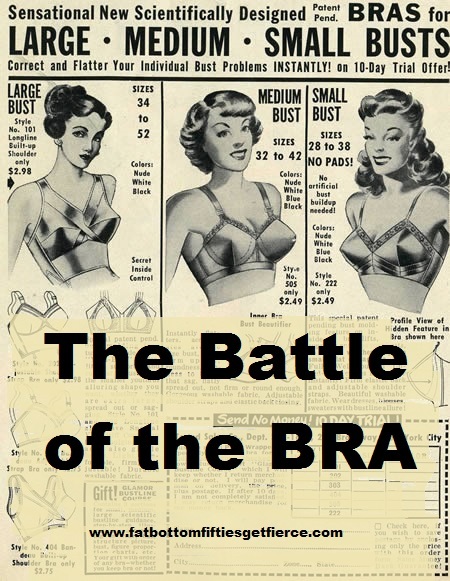 I was shocked when the bra expert told me, with a very serious expression, that the life of each bra was “a good nine months.” I was quite sure that, for those prices, they would last much longer than nine months. Which is why today every one of my bras has only one underwire. When they poke, they get yanked. Until they poke, you can’t get the damn thing out. So everyday I greet the world with one well-supported breast and a smashed potato at it’s side. I alternate between left underwires and right underwires to keep people guessing as to what my problem is.